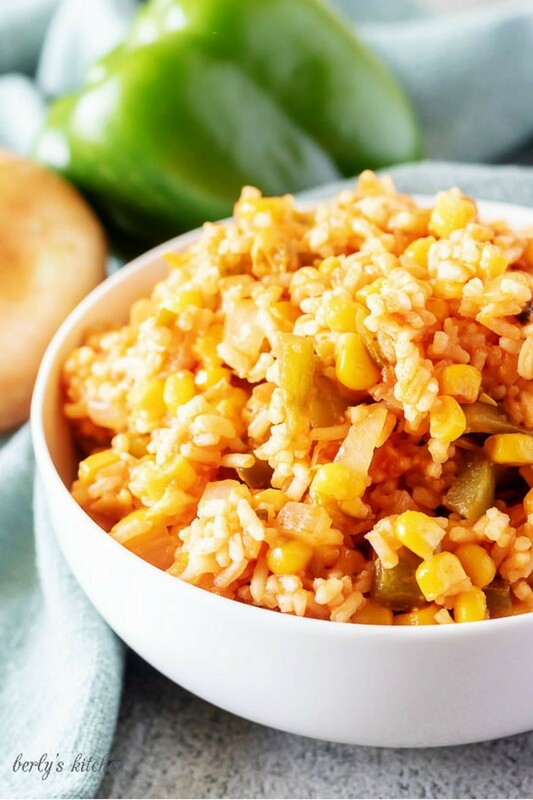 Our Tex-Mex inspired easy Mexican rice recipe makes a great side dish for your next Fiesta Friday. Best of all it’s ready to eat in under 30-minutes. Lately, I’ve been rummaging through many of the old cookbooks my grandmother gave me to find inspiration for some of my blog posts. Occasionally, I’ll come across a small 4 x 6-inch note card containing a handwritten recipe from my grandmother. Those are always fun to make. It just so happened, she gave me a Mexican Rice recipe. The ingredients and directions looked pretty straightforward. Since John and Kale have both had her Mexican Rice before, I knew it would be a hit in our household. I followed her directions and was surprised at how quickly this dish cooked. It was ready to eat in about 20-25 minutes. The longest part was cooking the peppers and onions and allowing them to soften. Grandma’s easy Mexican Rice recipe uses instant rice, so it was cooking within a few seconds of adding it to the liquid. Her recipe also calls to add shredded cheese over the top and let it melt before serving. However, I decided to just dump it into the rice and give everything a quick stir. First, heat canola oil in a saucepan over medium heat. Now, you could use vegetable oil if you so choose. With that being said, I would only use olive oil if I had no other choice. It’s just a preference here, but that’s my two cents. Next, add the onions and green bell peppers and cook until both are soft. This process should only take a few minutes. Given the fact the rice is going to boil, there’s no reason to go crazy and overcook these vegetables. Then, add frozen corn, broth, and salsa. That’s right, just dump them right into the pot. It will lower the temperature of the pan, but that’s okay, you can bring up the heat a little to compensate. At this point, stir the ingredients to combine them and bring the mixture to a boil. Afterwards, pour in the rice and cover. Here’s where the minute rice shines in this easy Mexican rice recipe. If you were using traditional rice, you would need to let it cook for a bit before the next step. That’s not the case with this recipe. Once you’ve added the rice and covered the dish, remove the pan from heat and let stand for 5 minutes. For this reason minute rice is the perfect choice. You could use traditional white or brown rice; however, you will need to let the pan boil according to the instructions on the packaging. Otherwise, you’ll have under cooked, crunchy rice and nobody wants that to happen. Finally, after the 5-minutes have passed, add the cheese and fluff the rice with a fork. All done, you have a delicious Tex-Mex inspired easy Mexican rice. You can pair it with burritos, enchiladas, tacos, etc., you get the idea. Since it only takes about 30-minutes, it truly is a simple, quick, side dish recipe. We hope you enjoy it! You can use vegetable broth instead of chicken broth to make this dish vegetarian. For a lower calorie option, omit the cheese. If you don’t have salsa, try using canned tomatoes and green chiles, along with a few Mexican themed spices. Looking for similar recipes or another side dish? How about Easy Homemade Guacamole, Spicy Jalapeno Cornbread, or Slow Cooker Three Been Chili? 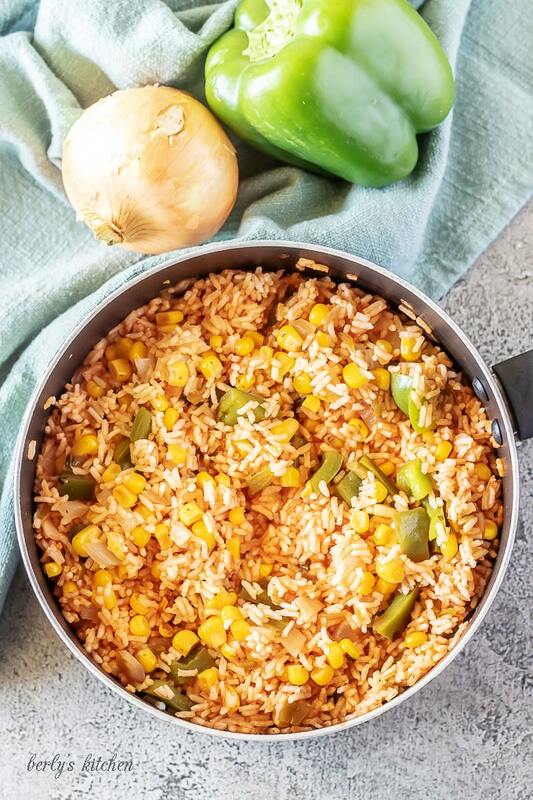 If you like this Mexican Rice recipe, please leave us a comment and rate the recipe card. You can also find us on Facebook, Pinterest, Twitter and Instagram searching for Berly’s Kitchen! 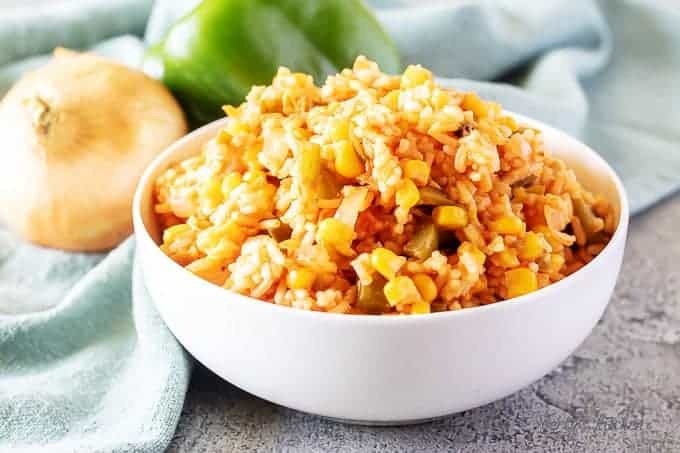 Mexican Rice makes a hearty side dish or a full entrée complete with tomatoes, onions, green bell peppers, and sweet corn. It’s incredibly simple to make, cooks in minutes, and only requires one dish. First, heat canola oil in a saucepan over medium heat. Next, add the onions and green bell peppers and cook until both are soft. Then, add frozen corn, broth, and salsa. Stir to combine and bring to a boil. Afterwards, pour in rice and cover. Once you've added the rice and covered the pan, remove the pan from heat and let stand for 5 minutes. Finally, add the cheese and fluff the rice with a fork. The calories listed are an approximation based on the ingredients and a half of a cup serving size. Actual calories will vary. 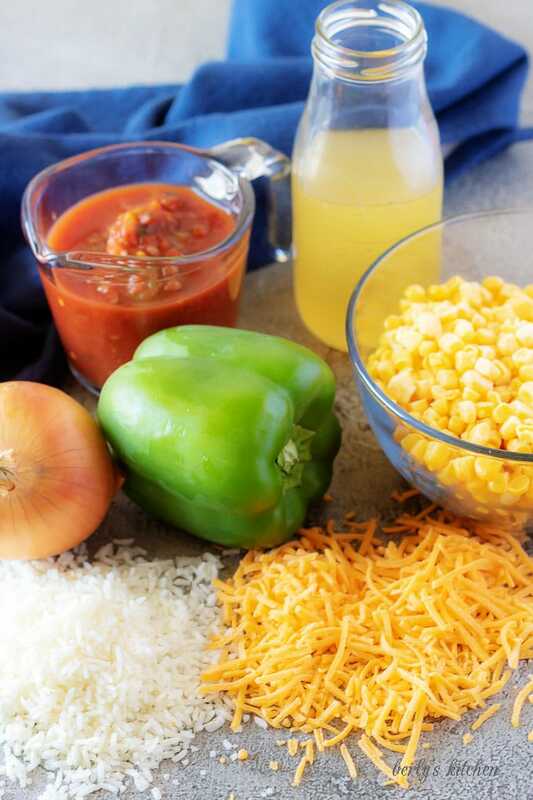 The Mexican rice can be stored in a sealed container in your fridge for up to 3-days. This looks so good! I would make this recipe exactly as you have, but might change it up once I’ved tried it out a time or two, and depending on what I have in my fridge! Thank you, Heather! I would definitely recommend adding some cheese. If you like spice, jalapenos would be a nice touch. Thank you, Danielle! My grandmother has some great recipes, and I hope to make some more soon. Can’t beat a good Mexican Rice! 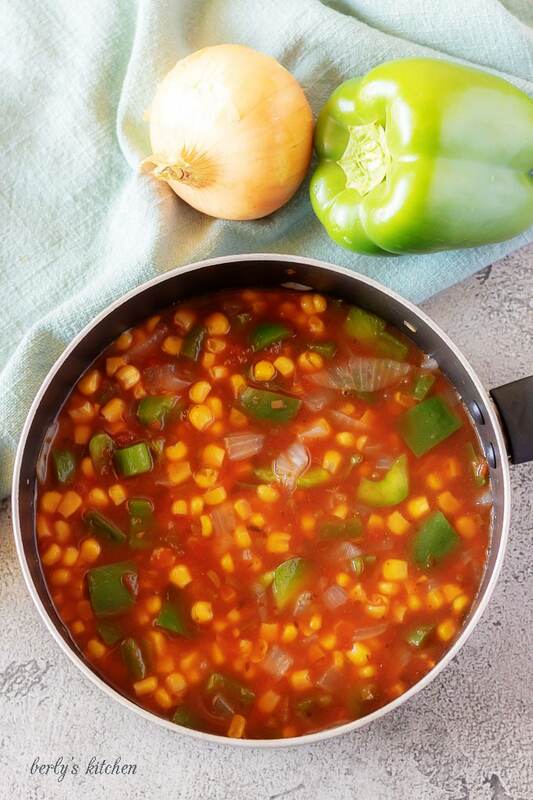 Great recipe Kimberly, thanks for sharing… can’t wait to try it! Thanks, Silvia! It’s one of my family’s favorites. Ooohh, this looks delicious! Fairly easy too. I’m going to put it on my menu plan for next week and I’ll let you know how it turns out. Looks delicious. Cant wait to use as a side for my next taco tuesday! Hi, Leanne! Great idea for Taco Tuesday! This looks really amazing. I love how easy this is! I have made Mexican Rice before, but I haven’t used salsa and so I am excited to try it! The salsa was a little strange to me at first but it works! Plus it makes this dish easy to make. we LOVE Mexican food in my house!! this is a perfect recipe for us to try! Awesome recipe! I never thought about prepare I g rice this way! Looks super! But the main thing that gives me a hard time when it comes to mexican food is the corn itself…I just don’t like it haha! My grandmother gives me inspiration for cooking too! 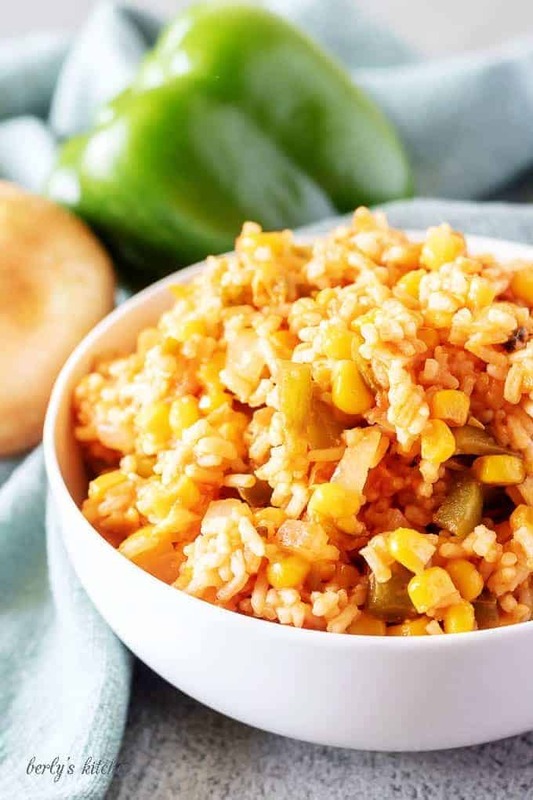 I love Mexican rice and will definitely give this recipe a try! Grandmothers have some of the best recipes! 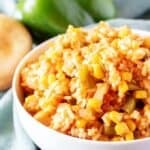 I’ve been looking for a good Mexican Rice recipe and this is perfect! Yummy! I’m going to make this for sure – it looks so easy and I bet we will love the taste. Thanks! Hi, Carin! This recipe doesn’t take long at all. If you decide to make it, I’d love to know what you think. Tash, I saw your comment and was attempting to answer but had some technical issues within the system and the comment disappeared. I hope you come back to check so you see the response. 🙂 If you cook the rice separately, I would recommend omitting the broth. That is used specifically to cook the rice. Leaving it in will cause the recipe to become soupy. Hi, Amanda! I would use olive oil in place of canola. Had this not been my grandmother’s recipe, I would have changed the canola to olive oil anyway. 🙂 Still working on a good salsa.